Flat roofs are constructed on both domestic and commercial properties for a variety of reasons but primarily because they are less expensive to construct than pitched roofs. With regard to commercial and public buildings, flat roofs can play a part in making the most efficient use of urban space, help create architecturally aesthetic designs and be used in the construction of complex building designs. On occasion flat roofs can also provide an elevated deck for pedestrian access, as long as a balustrade is constructed around the perimeter to satisfy Health & Safety requirements. Indeed, in the 1990’s we designed a flat roofed domestic conservatory with a GRP roof which had access through new double doors from an upstairs bedroom to provide a large balcony. But to state the obvious, a flat roof should never be perfectly flat otherwise it will hold water and, depending on the surface, may deteriorate more quickly. It should therefore have a slight fall of at least 1 in 80 to allow rain water to flow to gutters or other collection points. Few new domestic properties are built these days with flat roofs but there are still millions of flat roof extensions on older properties in the United Kingdom which will require maintenance from time to time. Council-built properties in particular were often constructed with a rear single storey extension which had a flat concrete roof. These flat roofed extensions often began life as an outside toilet and coal store which became incorporated into the living accommodation to provide a kitchen area, utility room or downstairs bathroom. Some of these flat roofed extensions have been long since demolished but those that remain need to be better insulated and made watertight. Many garages also have flat roofs rather than more expensive tiled pitched roofs and these must also be maintained from time to time. When most people think of flat roofs they imagine the type of bitumen felt roof normally associated with sheds and other outbuildings. Bitumen felt flat roofs, which typically last around ten years are not recommended for habitable buildings but are nevertheless sometimes used for them. We have decided to concentrate here on longer lasting flat roof solutions which can certainly be used above habitable rooms to provide water tight, well insulated roofs. Consequently, on subsequent pages, although we have included information on bitumen felt roofs, our three recommended flat roof products are rubber EPDM roof membranes, coloured glass reinforced polyester (GRP) roofs and polyvinyl chloride (PVC) roofs. Bitumen felt roofs are probably the most common type of flat roof in the United Kingdom and though they are not recommended for use on habitable buildings, they quite often are. We will cover the processes involved in the cold construction a flat felt roof as opposed to hot construction where hot bitumen is used. 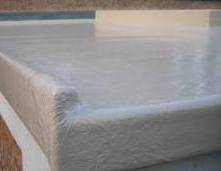 Rubber EPDM membrane is a 100% cured, single-ply roofing membrane made of Ethylene-Propylene-Diene Terpolymer and according to Firestone™ one of the major manufacturers, it offers unique features and benefits. Since it was introduced in the early 1980’s, Firestone™ EPDM rubber roofing membranes have been installed on hundreds of thousands of commercial, industrial and residential flat roofs. Commonly referred to as fibreglass, glass-reinforced polyester was developed half way through the twentieth century and was used for a wide range of applications due to its high strength and non-corrosive properties. It was initially used in boat building – particularly for small craft such as canoes – but its relatively low weight, waterproof properties and strength led to its use for water tanks, ponds, roof lights and even body panels for cars and commercial vehicles. Its ability to be moulded to practically any shape imaginable and be constructed in situ means that it is particularly suited to providing a waterproof surface for flat roofs – new or old. Sika Roof Assured™ specialises in the installation of Sika Sarnafil™ single ply PVC roofing systems for the domestic market and although the product is extensively used for commercial roofing, most of the information in this website is tailored for the homeowner. Sika Sarnafil™ single ply PVC roofing systems can be used to replace an existing roof which is leaking, one which has reached the end of its functional life, or for new build projects. It is easy to assume that this type of roofing product is only suitable for flat roofs but Sika Sarnafil™ single ply PVC roofing systems can be used on roofs with a pitch of up to 35 degrees.